A policeman and four casino staffers were shot after masked gunmen stormed the Ramada Princess Hotel casino at Providence, East Bank Demerara at around 03.30 hrs yesterday. Three of the bandits escaped with an undisclosed sum of local and foreign currency they took from the casino as well as money and valuables they took from patrons during the half-hour ordeal. But police captured a fourth bandit as he was trying to escape through a back door when the ranks arrived. They also impounded a car that the attackers left behind. Police retrieved a shotgun that the gunmen had taken from a security guard and another firearm that one of the bandits had disposed of before escaping. At press time last night, police were hot on the trail of the rest of the gang. Crime Chief Wendell Blanhum disclosed that the detained gunman, known as ‘Dougla’, has been cooperating with investigators. The suspects are believed to be from Onderneeming, Essequibo, Independence Boulevard, and a third from Kitty and South Ruimveldt. “The police have information about who the people are. The homes of the suspects were searched and wet clothing was found at two locations. The occupants were questioned, and they indicated to the police that the individuals did not sleep there last night (Thursday); they (the suspects) went there early today, (Friday) changed and left. Among those wounded are Police Lance Corporal Andrew Richardson of Impact Base, who was shot to his abdomen; Eon Garraway was shot in his left hand, James Gregory sustained a gunshot wound to his left foot; Orlando Knights was shot in the left hand and Udairan Sookraj sustained injuries to his right hand. Melissa Ferguson, Jermaine Mason and Roshel Fraser were assaulted during the ordeal. There are indications that Lance Corporal Richardson and staffer, James Gregory, may have accidentally shot each other. “James was clearing out the kitchen and same time he (the police) went into the kitchen and the police had a brown coat over his uniform so when James hear the door open and he turn around, the policeman shot at him and he shot at the policeman,” a hotel staffer said. The wounded policeman was admitted to the Georgetown Public Hospital Corporation (GPHC), while the staffers who were shot were treated at Dr. Balwant Singh Hospital. A police release stated that the attack began when four men with firearms entered the casino and discharged several rounds into the air. After relieving a security guard of his shotgun and ammunition, the gunmen ordered patrons and staff to lie on the ground. They then took the security guard to the cashier’s cage where the cashier was also held at gunpoint and relieved of an undisclosed sum of foreign and local currency. The men arrived at the hotel in a white vehicle bearing a fake number plate, PRR 2545 and three of them managed to escape on foot. Police were able to apprehend one of the suspects, who was left behind in the casino. Police also impounded the car, which was left at the scene. Video footage taken by a reporter showed the licence number PPP 4111, imprinted on the vehicle wind-screen. Kaieteur News understands that the driver of the vehicle was carjacked last Sunday after taking two men to Buxton, East Coast Demerara. Video footage taken by a reporter after the attack showed patrons still on the ground, and one terrified woman weeping as she hid under a table, as police ranks, including ‘A’ Division Commander, Clifton Hicken, scoured the casino for the gunmen. The ranks are also shown lifting a barman who was shot in the hand. They are later seen with the gunman who was captured at the scene. The security guard who was relieved of his firearm said that “about five of them” come up to him and told him not to move. “Dem man seh pass de shotgun, (and) dem man tek away the shotgun and tell me sit down. “If I did shoot, dead sure I woudda deh pon de ground, but I woudda kill one of dem,” the guard said. Another guard said that he was attacked while he was at a guard hut. One patron said that he was inside the casino playing on one of the machines when the men stormed the building. “All I hear was ‘everybody go down on the floor’ and I thought it was a mad man run in but when I watch, I see a man with a gun,” the man said. He added that everyone in the casino followed the men’s instructions. I turn and see everybody lying on the ground and I decide to lie on the ground, too. “I was on the floor and I was hurrying to take out my money to put it in my boots and same time the guy pass and say ‘fat man what you doing there? Pass your phone,’ and he asked what else I got and when I said nothing, he go away,” the man recalled. The patron and some others have vowed not to go back into a casino. A woman also said that she had just won some $20,000 when the gunmen entered the premises. 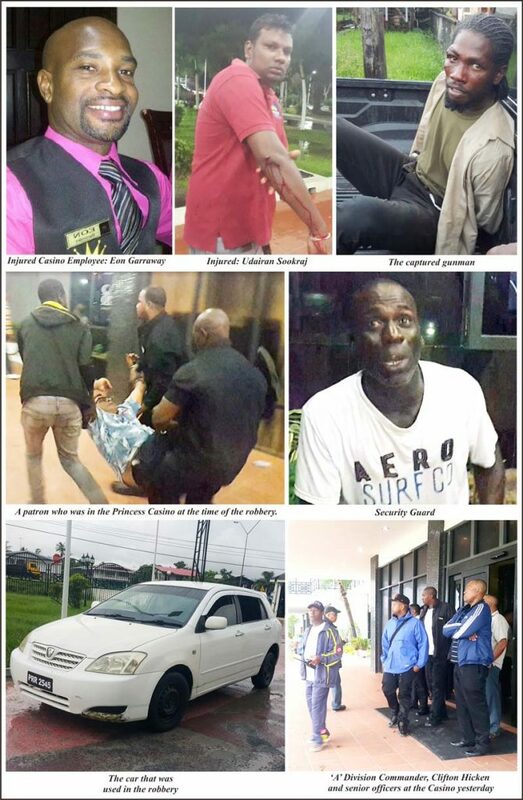 According to one of the hotel’s taxi drivers, the men pulled up alongside his vehicle and four men exited with guns. He said that once they were inside, the men started to open fire before ordering everyone to lie on the floor. “They robbed the casino and everyone who was in there. After some time, the one who was guarding everyone shouted ‘time up’ and two of them followed him while one of them was still at the back,” the taxi driver said. He added that one of the gunmen told the other two robbers who were already at the front preparing to escape that the fourth man was still at the back, but the three men continued with their escape plan. Kaieteur News understands that when the police arrived at the scene, the fourth gunman was struggling to get the casino’s back door open. “The back door is funny. You cannot open the door from the inside…you have to go all the way around to the outside and opened it so that is why he couldn’t escape,” a hotel employee said.